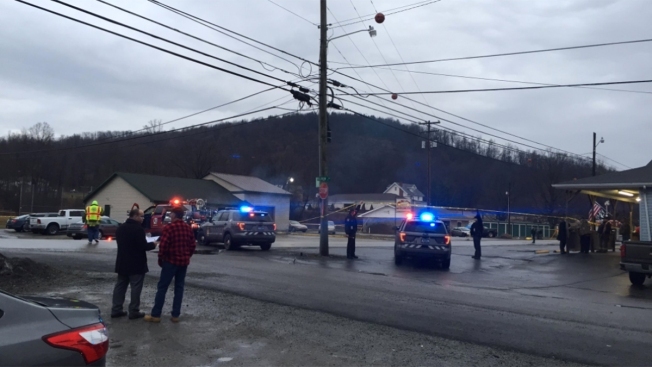 Police respond to a shooting at a Pennsylvania car wash where several people died, Jan. 28, 2018. A man suspected of gunning down four people at a Pennsylvania car wash was driven by jealousy, according to family members of the shooting victims. State police said Timothy Smith, 28, was armed with a semi-automatic rifle, a .308-caliber rifle and a handgun and was wearing a body armor carrier without the ballistic panels inserted when he opened fire early Sunday morning at Ed's Car Wash in Saltlick Township, a rural town about 55 miles (89 kilometers) southeast of Pittsburgh. Twenty-seven-year-old William Porterfield, 25-year-old Chelsie Cline, 23-year-old Courtney Snyder and 21-year-old Seth Cline were all killed. Smith was on life support Sunday and not expected to survive after suffering a gunshot wound to his head. State police said it was possible that the gunshot wound was self-inflicted. Authorities would not reveal how Smith knew the victims, but Chelsie Cline's half-sister, Sierra Kolarik, told the Pittsburgh Tribune-Review that Smith had developed an obsession with Cline. Cline shared a meme on her Facebook page last week that read, "After this week, I rlly (sic) need to get taken out ... on a date or by a sniper either one is fine w me at this point." A Facebook friend of hers named Tim Smith replied, "I could do both." Porterfield's pregnant wife, Jenna Porterfield, 24, told the Pittsburgh Post-Gazette that a state police investigator told her that Smith was a jealous former boyfriend of Cline. Porterfield said that she was told by family members of other victims that her husband and Cline had spent the past two days together after Cline ended a relationship with Smith. Porterfield said that she and her husband — who were married in November — had been "having some troubles" this month. "I'm not holding that against Will. We weren't fighting. We were fixing. And if he was with someone else while we were having problems, honestly, I don't care what he did. I'm not going to hold that against him," Porterfield told the newspaper. "I'd give anything to have him back." State police said Smith was the first person to arrive at the scene and parked his pickup truck on the side of the two-bay car wash. They said he shot Porterfield and Cline when they got out of their car and walked to the side of the car wash.
Snyder and Seth Cline arrived in a pickup truck at the same time and were both shot and killed in their vehicle, state police said. Another unidentified woman in the rear seat took cover in the truck and survived with only minor injuries from broken glass. Cayleigh Myers said she was friends with Seth Cline, Chelsie Cline's half-sibling, and described the construction worker as "very outgoing, very funny and very smart." "You always had fun when you were around him," Myers said. "He would give his shirt off his back for you, anything, it didn't matter what it was, what time it was, if you need him, you could call him. He was everything."